Routes is a local project offering free, personal support for anyone needing some help on their journey into employment. 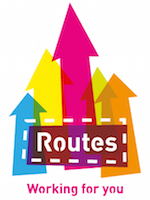 Routes is jointly funded by European Social Fund and Big Lottery Fund. At The Hangleton & Knoll Project, we offer a Routes Information and Advice service for adults of all ages. Taking part in Routes is all about building your confidence, getting up-to-date skills and making real progress towards better work opportunities. How does Routes work for you? So why not get in touch today to arrange a chat over a cuppa and find out what Routes can do for you? Routes is a collaborative, multi-partner project led by Community Works, to help people on their journey into employment - providing intensive internship placements, local learning opportunities and emloyability focussed information and advice.